When designing a product page, it is often necessary to present a number of images in a succession, also known as a slideshow. With the raise of the jQuery library and its numerous plugins, there is an abundance of ready-made solutions which address this problem. However, to make a lasting impression to your visitors, you need to present them with something they have not seen before. Today we are making a jQuery & CSS mosaic gallery. Mosaic, because it will feature an interesting tile transition effect when moving from one slide to another. The mosaic effect of the slideshow is achieved by dividing the original image into smaller parts. These tiles, which contain parts of the image, are sequentially hidden from view, which causes the effect. The markup of the slideshow is pretty straightforward. It consists of the main slideshow container element (#mosaic-slideshow), a left and right arrow for previous and next transition and the mosaic-slide div, which is inserted by jQuery at run-time. To make this effect work (and most importantly look good), we have to add a few lines of CSS. Only the code directly used by the gallery is shown here. You can see the code that styles the rest of the demonstration page in styles.css. The slideshow is contained inside the div with an ID of mosaic-slideshow (or #mosaic-slideshow, if we refer to it in a form of a CSS / jQuery selector). There can be only one such div in the page, hence the use of an ID attribute. However there can be more than one mosaic-slide divs in the page. The effect itself is achieved by stacking two slides on top of each other and hiding the tiles of the first one to reveal the ones of the second. This is why we are using a class name instead of an ID. Some of the more interesting rules presented here are the three CSS3 rules for rounded corners. As the CSS3 standard is still a work in progress, browsers don't support the regular border-radius property yet (except for the new 10.50 version of Opera), and need vendor-specific prefixes to recognize it. The -moz- prefix is used by Firefox, and -webkit- is used by Safari and Chrome. The arrow class is shared by the previous and next arrows. They do need individual styling in addition to this common rule, so we add it after this. We are also using a CSS sprite as the background for the arrow divs. It contains a regular and hover state for both arrows, which spares us from having to use four individual images. "CSS spriting" is a widespread technique used by web designers. It allows the designer to join multiple smaller images into a single larger one, called a sprite, which is downloaded faster and saves the web server from multiple download requests. After this, the designer can use the CSS background property in conjunction with setting the elements to a fixed size, to show only the part of the sprite image that they need. prev() - analogous to next(). The $(document).ready() method is executed once the page has finished loading. This will ensure that all the divs and other elements are accessible to the script. Inside it we bind a function for the click event on the previous and next arrows, preload all the images, show the first slide (otherwise the slideshow would be empty) and set up the auto-advance interval. The transition function uses the global current object to store the id of the currently shown slide, and a reference to the current slide div. 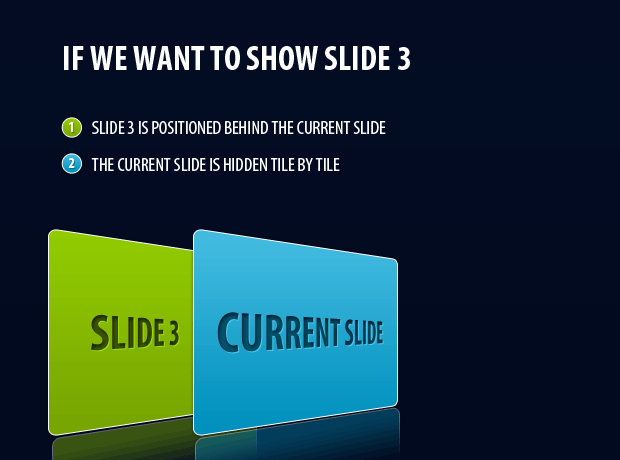 This is later used to remove leftover slides and prevent a transition from occurring if the same slide as the currently active one is to be shown. Notice how we use the each method on line 31 to loop through the tiles of the current slide and schedule them to be hidden in i*10 milliseconds in the future. As i is incremented for every tile, this mean that they are hidden 10 milliseconds apart from one another. The parameter passed to generateGrid() is an object containing the rows and the columns we want to be generated, as well as the image to be set as the background of the tiles. While generating the tiles, the background image is offset according to the current position of the tile in the row and in the column. Finally the tile is added to an empty jQuery object which is returned at the end. With this the mosaic slideshow is complete! Today we created a slideshow with an animated mosaic transition effect. You can modify it to include a different number of rows and columns or change the way slides are changed entirely. What do you think? How would you use this slideshow? How in the world do you learn how to make such things as these! Great tutorial, yet again! It's such an awesome animation I 've ever seen with jQuery. Thank you Martin! Really nice effect, I love the transition. Thanks for the tut! Like I said on Twitter - these kinds of articles are truly innovative and new. Thanks a lot for the eye opener and can't wait to see more! It is very interesting. I'd like to use too. The most awesome thing I have ever seen jQuery do!! Bookmarked and shared for future reference. @Ivor, it actually was with a fadeOut effect originally. Unfortunately almost all of the browsers I tested it with (except for chrome) couldn't cope with all the JS effects and the result didn't look good, so I switched it to 'visibility:hidden' instead. It's a verry nice idea. I think you could do a jquery plugin with that example. Thanks for sharing. Really nice effect, I love the transition. Thanks. It always seems like jQuery is even more useful than I know. awesome tutorial. Really piece of work! Your site rocks. Again a great tutorial, really very nice. Great idea! Thank you for share. 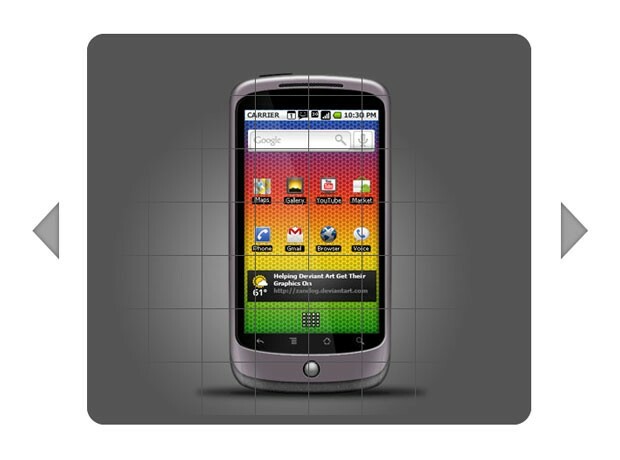 Hey do you guys know where I can snag that android device PSD to mockup stuff in? How would I go about making each of the tiles appear randomly, rather than in order like in your example for this tutorial? Great tutorial, keep up the good work! amazing!! How did you work it out? how about an autoplay feature? I am trying to change the size of the box. Where else do i have to alter sizes? it will effect the size. and can you please tell me how to remove those grids coming on the images. This script is simply fantastic! Thanks for sharing... I would also suggest an autoplay feature (pause, stop, play buttons). Some of my images are in url's with spaces. Did not show these images in the mosaic. I changed the space by %20, showed no images. Looks good! But with all do respect: In Flash I could load the whole image (instead of many tiles) and then execute code to split it into small tiles. In other words, I could use Flash to make a simpler-to-use version of this slideshow with only a little additional coding. Is there a way to do this in jQuery? In Flash I'd use the bitmap object and the draw command. I see! That makes sense. I like it. It's very similar to how I would do it with the AS3 bitmapCapture function. I'd capture each tile, each time adjusting the source image's position accordingly. The resulting bitmap objects can be manipulated separately. How would JQuery perform if each tile were tweening simultaneously? It is just what i was looking for! Thanks. How can I change the script such that it reveals the next image from the center instead of top? Cool tutorial, but I think it would look better with some Fade in there too.